Do you remember this block of the West Plaza neighborhood? 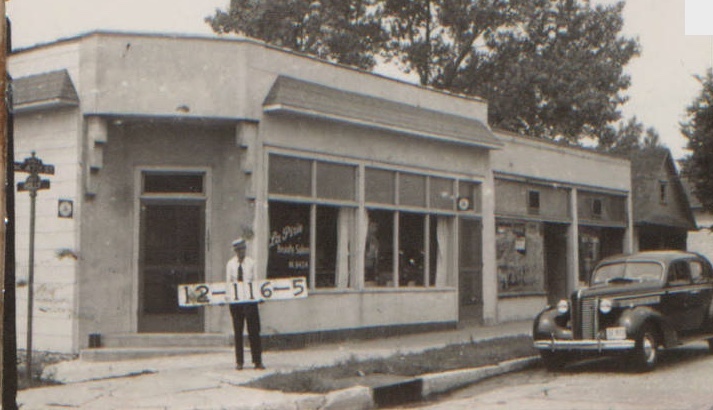 Like many corner stores, this one at W. 47th Street and Holly had been many things through the years. Earliest mention is in 1917, when it was a grocery store. By 1921, it had become a meat market, then served as a clothes pressing establishment before reverting to a grocery store in the mid-1930s. It became a beauty salon in the late 1950s and is still in operation. In the 1930s and 40s, this West Plaza neighborhood block had a corner grocery store and was home to young working-class families who moved in and out. A reader turned our attention to the block bounded by Mercier and Holly between 47th and 48th Streets, where, she wrote, she had heard a respected sculptor had once lived and hosted dinner parties for the art scene. Research on the block didn’t turn up his story, but maybe one of our readers can fill in the details. Meanwhile, where’s what we know about the block. 1907 Tuttle and Pike Atlas. 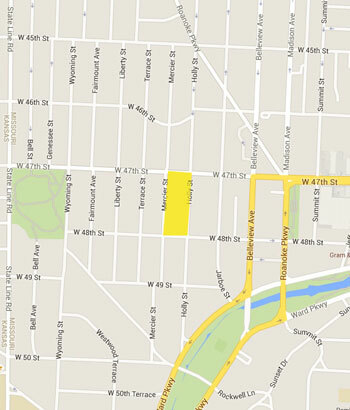 A 1907 map shows the block when it was first being subdivided, but before development really began. Several of the major property owners were well-known Kansas City business and civic leaders who bought parcels of land but never lived on the block. It shows Henry C. Murdock, a civil war veteran, owning the corner of 48th and Mercier. 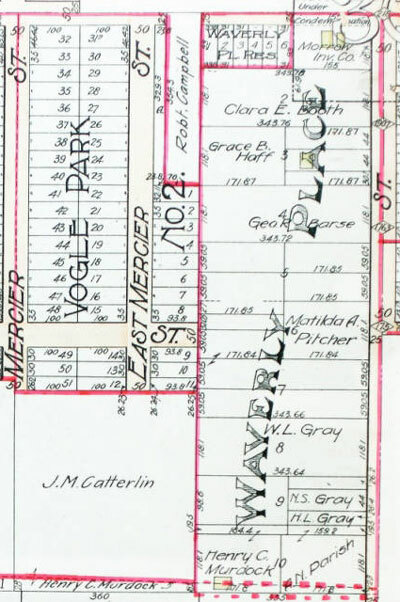 Martha A. Pitcher, a former teacher and an active church volunteer, owned a few plots. George R. Barse, a cattleman who suffered a nasty divorce after he claimed in 1905 that his wife tried to poison him with morphine, also owned land here and in other parts of the city. George Reade, a club grounds keeper, his wife, son, three daughters, and brother-in-law. Another jewelry salesman, Stephen J. Smith, his wife and daughter. Butler Morris, a railroad conductor, and his wife Esther. Ten years later in 1940 (the last year for which census records are currently public), most of the 1930s residents had left. The new residents, mostly young families with one or more children, either rented or owned their homes. The homes along 47th Street were all occupied by widowed women. The block also was home to a city policeman, a cattle salesman, the operator of a bar in the street railway, and an auto mechanic. The slideshow below shows the block as it looked in 1940.